Liggett and Steif (2006) proved that, for the supercritical contact process on certain graphs, the upper invariant measure stochastically dominates an i.i.d. Bernoulli product measure. In particular, they proved this for Zd and (for infection rate sufficiently large) d-ary homogeneous trees Td. In this paper, we prove some space-time versions of their results. We do this by combining their methods with specific properties of the contact process and general correlation inequalities. One of our main results concerns the contact process on Td with d ≥ 2. We show that, for large infection rate, there exists a subset Δ of the vertices of Td, containing a “positive fraction” of all the vertices of Td, such that the following holds: The contact process on Td observed on Δ stochastically dominates an independent spin-flip process. (This is known to be false for the contact process on graphs having subexponential growth.) 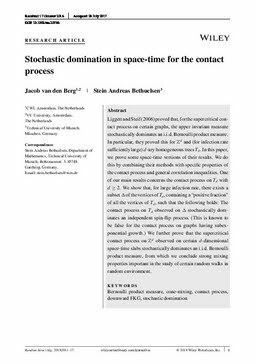 We further prove that the supercritical contact process on Zd observed on certain d-dimensional space-time slabs stochastically dominates an i.i.d. Bernoulli product measure, from which we conclude strong mixing properties important in the study of certain random walks in random environment.